Once upon a time, we built our dream home, but the piece we did not choose, was the front door. For years we battled with side light windows, and the complete lack of privacy. Our babies were running around in diapers, or the piece of clothing we desperately needed was in the downstairs mudroom. The only way to get there was down the front steps in front of the side light windows. The lack of privacy is an everyday battle in our home. We do love the light of the side light windows, but, we do reserve the right to privacy. When you don’t want to be here when the doorbell rings, the person at the front door can see right in, ugh! Hate that! Now, add in a cat or a dog who wants to see outside after you put up sheers and you have the recipe for a daily disaster. Pets want to see outside and they have absolutely no boundaries. Sheers are not the answer. So, what are the best side light window treatments especially if you have a pet? I have the answer! *Please note, due to lighting, change of window coverings, sunny and not sunny days, night time photo shoots and day time photo shoots, the colors on these images will all be different. It would be impossible to get the same lighting on any day. I did not Alter any of these photos, I wanted you to see the real deal. True to form as a DIY person. Lighting is just lighting. We built our home a few years back, and while I wanted everything int it, we had to wait to make some changes. Buying a house is a huge financial undertaking. At the same time we purchased we had kids in private school, ice hockey, new car payments, and the list just went on and on. You get it, the natural profession of life. After all that dust settled it was time for braces and other oddities the, “we need it list” never ends. First, as a DIY kind of gal, I attempted to cover with some decor each season. The seasonal stuff provided at best, minimal coverage. 3 kids, one in diapers, and lovely front side lights which let the whole word passing by see right on into the house. We might as well have just let them open and say, “welcome world!” Battling these windows got old, we had zero privacy in a very busy neighborhood of over 230 homes. Well, here’s the thing about sheers, they are SHEER. While they offered less light, and hampered the ability to see straight in, they still allowed the light of our others rooms to filter out and people to see in. However, this was as good as it is going to get at current. At least no one could see right in, but that did not stop our one neighbor. One day, a neighbor, felt the need to tell us, they rang our bell and we did not answer. They ‘knew we were there because the kitchen light was on and they saw it!” Here’s what they did not know, we were working on the construction of a bathroom in the basement! Drills running and our nightly adventure to take on the world and add in a much needed amenity. Why Am I Explaining The Side Light Thing? I am sharing this whole story with you because a lot of you have the same story and I know it will resonate. It was baby steps and then we just went for the change! Oh my gosh, she’s so darling is what you are thinking, but under that Santa hat is a tiny little beast that unleashes when she sees her ‘outside’friends! Help us all is what I have to say. If you have pets you already know where this is going. You saw the sheer and the arrow above? That comes down as soon as she jumps on the ledge.. but there’s more! Now the real story and game-changer. Bella the Cat. She entered our lives and stole our hearts. You may remember that Bella is a rescue cat. She is indoor only and as my husband says, “she hit the jackpot getting this life!” There is nothing she needs and she rules the interior. Ask her where the best seat in the house is, and you will find her snuggled up the most luxurious blanket. Bella has a chipmunk friend through the window. The Chipmunk backs up to her, rolls his eyes backwards while she stares head on at him. This happens from the back door to the Front side lights. Our largest problem is that Bella somehow undoes the sheers from the tie downs and has her Chipmunk moment daily. A battle of the sheers vs. Bella takes on a whole new meaning. Goodbye Sheers Hello Faux Wood Plantation Shutters. Something had to give in our home, and it was the side light sheers. NO more can I deal with inadequate side light coverage, nor could I deal with Bella the cat and the Chipmunk ripping down the sheers each day, a few times a day. That’s the ‘A HA’ Moment we needed. We needed to make this a DIY project. One that would not take us all night. Michael and I ordered the samples from Blindster to make sure the color options would match our existing window wood slats. The samples arrived and we chose. It was all fast, easy and painless. Then we wondered how hard this was going to be? Had we taken on a DIY that might be insurmountable? What would the shutters be like when they came in the box? Honestly, Michael is such a pro at DIY, I did not waste thoughts on it. 2 Long boxes arrived and Michael set up to work. Basically it took him 15 minutes to construct the frame of the shutters. We did the left side first, then the right. Easy Peasy! I kept touching them, so smooth and sleek and what a classic look. Seriously, let’s get moving, I gotta have these up and I can’t wait to see and reveal. So just to make me wonder, and you, what it is going to look like, here’s what I got to see at first. Of course working side by side with Michael I figured I would know more faster, but he likes to surprise me too, so this is how we started. Just with the frame. Yes we are ready for the change. I guess you can tell from the pictures. Just setting that Plantation Shutter frame against the door meant the tides were about to change. It’s exciting because we will be able to open the shutters or fully open the shutter panel. We regulate how much of the world we let in, not the side lights! You are going to need 2 people to hang. Unless you McGyver a way to keep the shutter frame setting straight up while you are working on it, 2 sets of hands are better than one. Trust me, this is such a big difference. The shutters add a well-needed dimension to the room. First we made sure the fit was good, before we let the world see in as we began our project at night after our work days. See the hinges on the left? We have pins for them and we will place the shutters in there. Get ready! Now unfortunately, we have to let the world in one more time, before we shut it out for good! Woot! I can not wait, no more passerby’s on the sidewalk, no more neighbors peeping in. It’s about to get private in here! I am so ready. Here we go. Do you already see the difference? I mean the sheer is ‘eh’ but the frame makes a window a more decorated item and allows it to enhance the area. I love framing and this is perfect for those side lights. Faux Wood Plantation Shutters are durable. They are what we need. Not you have to make sure they are level, so take your time. Mike is working on the level piece right here. The fall of the shutter door will be affected improperly if not level. It took minutes, and suddenly it’s done! The one window is covered. WOW! Now all the shutter pins go in. One by one. We had one in and tested it for level and plumb. We are all set at least with the first one. In the image you see the lever that will open and close the shutters. This is where you get the light or the privacy. However there are other options on the shutter to get light and privacy. I’ll show you in a minute. We are not done, we have the first Faux Wood Plantation Shutter in, let’s reveal! I am so happy we made this decision, it may be one of the best to date! The sheers look, ‘cheap’, and frail, and not really durable. The Sheers are not at all the answer to privacy. Now look at the Faux Wood Plantation Shutter on the left. The Lever in the middle opens and closes the shutters. There are 2 panels, and the 2 panels are ONE solid piece. The panels can both be opened or we can open one and shut the other. 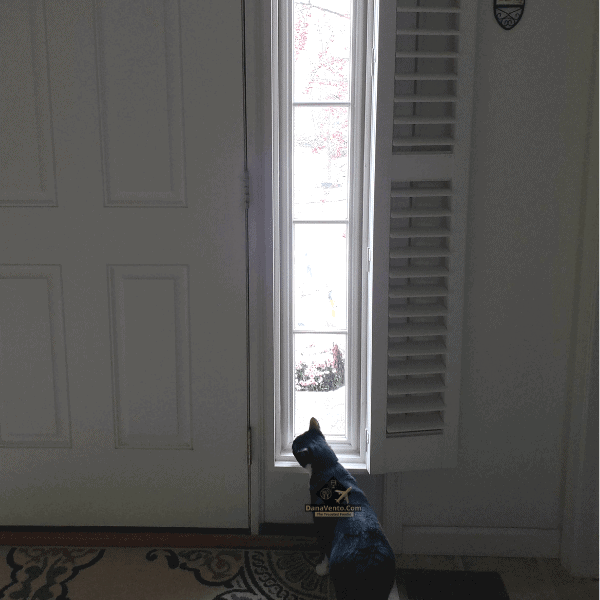 Last, the whole shutter opens, and I am about to show you why Pet owners everywhere can rejoice at this solution as the best solution for side light window treatments. Little Bella is thrilled. I open the panel during the day so she can look out. Of course I do not always open it, but it gives her the freedom to watch the chipmunk while NOT destroying my window treatments. Also, this lets a lot of light in. Some days it’s nice to open up! There are other times when Bella is more aggressive about looking outside and she likes to STAND On the frame of the side light windows. That’s fine now too, because I can open them up and she is no ripping down my sheers. She totally cracks me up. Bella will sit in front of the new Faux Wood Plantation Shutters and wimper a bit until I open them, then she will occupy herself for hours looking out there. I love this feature. If you have a cat or dog who loves to look out, these are the best solution. This is the configuration on some days. I have them open and partially shut. By night, there is NO way I leave them open because the kids are running all over with towels after showers or from playing outdoor sports. Bella, she just keeps guard of the front. Really, it’s been a work in progress, as we change up bits and pieces of the house we did not like. There are things that came standard and they are not meeting MY Standards nor Michael’s so away with them. This is just one of many DIY we are working on. Now that we have achieved privacy, I can start working on another few without any ‘neighbor’ interruptions and that will be great! The entry way is much more stunning, and once I flip the banister over from brown to stained cherry wood, it’s a completely finished room! Well, again, more to come on this, but I am dreaming of completion! Product Provided, story is my own, based on my personal usage and love of the brand. My cat loves to play with the curtains in my living room. It might be smart for me to do what you did and get rid of the curtains and put in shutters. It does also seem like it would add value to my home.